Read below for a description of each Fromagerie Sophie and Claiborne & Churchill pairing, and if you like the sound of these, come in to our tasting room today to try them! See our Wine and Cheese Pairing Part I and II here. When we had our staff tasting with Fromagerie Sophie, we learned that wine and cheese pairings should be complementary, delicious, and memorable, but that the best pairings are surprising. You can’t go wrong with goat cheese and Pinot, but this pairing of Claiborne & Churchill Runestone Pinot Noir and elegant Selles Sur Cher, a soft, french goat’s milk cheese dusted in black vegetable ash, really shocked us, and in a good way. Like the Runestone Pinot, this cheese has a long, fascinating finish that develops in the mouth over time. The use of ash in cheesemaking is a technique that’s hundreds of years old. 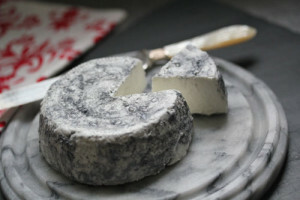 Originally meant to preserve the surface of young cheeses, it is now known that the use of ash helps in the development of beautiful, distinct surface molds, like those that you will find in this Selles Sur Cher goat cheese. Nothing pairs better with a bold, spicy red wine than blue cheese, and this pairing is no exception! Beenleigh Blue is a pasteurized sheep cheese made with vegetable rennet. It comes from Sharpham Barton, in South Devon (Southwestern England). 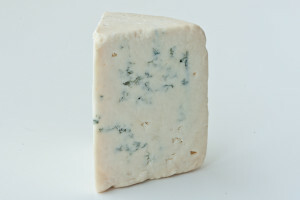 The remarkably mild, elegant blue-veined cheese has unique, sweet aromas of nectar and honeysuckle, and its semi-soft, fudgy, flaky texture reminds us a bit of coconut. Only a few bottles left of this delicious Syrah! 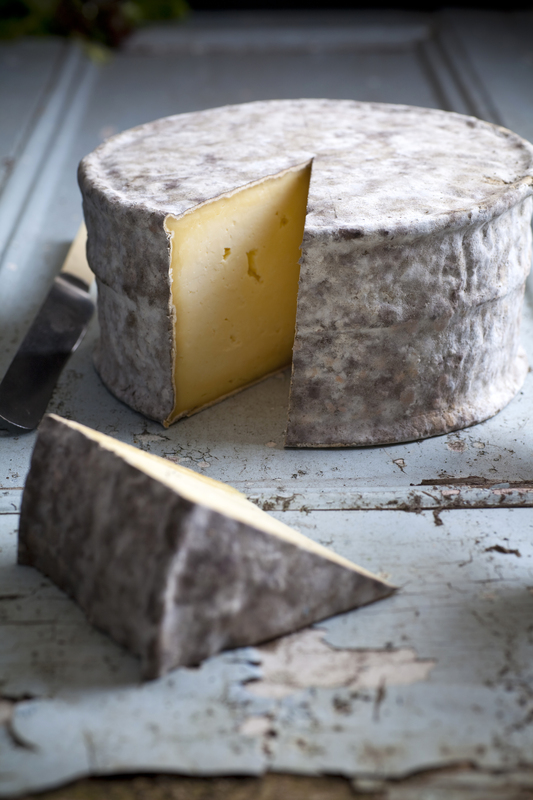 According to one of Beenleigh’s distributors – Neal’s Dairy Yard, in the UK – the milk for this English cheese comes from a flock of 250 ewes who graze on grass and clovers in the summer. Based on the time of year the cheese is made, it may take on distinct flavor characteristics: winter cheeses are more light and citrusy, while summer cheeses are more robust and earthy. 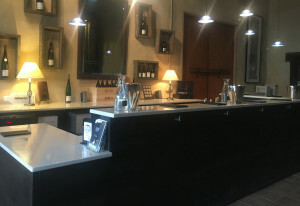 These pairings are a truly remarkable way to experience our fine wines and the incredible cheeses that Sophie and Paul have scoured the world for, bringing the best that Europe has to offer here to our little town on the Central Coast. Come experience these pairings daily at our Claiborne & Churchill tasting room, open daily from 11-5, and when you are done, stop by Fromagerie Sophie on Garden Street and pick up some cheese to pair with wines at your next gathering! See our Wine and Cheese Pairing Part I and II here. Hope to see you in the tasting room soon! Read below for a description of each Fromagerie Sophie and Claiborne & Churchill pairing, and if you like the sound of these, come in to our tasting room today to try them! See our Wine and Cheese Pairing Part I here. 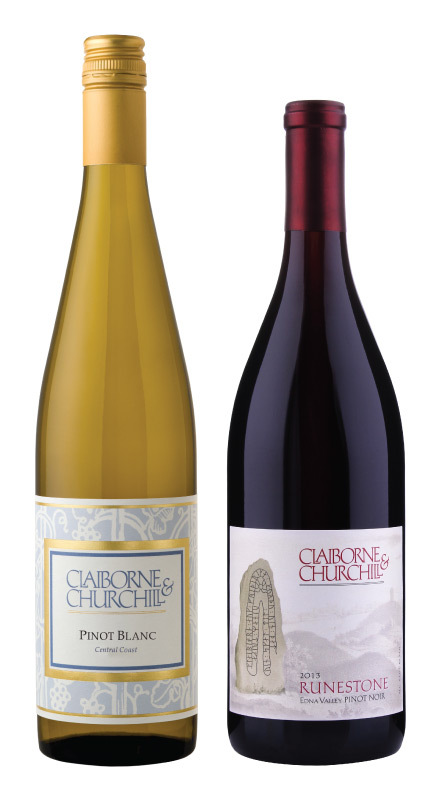 Claiborne & Churchill Dry Riesling, one of our most popular wines, is a surprising and satisfying complement to this raw cow Caerphilly from Somerset, England. Caerphilly is a mold-ripened, cow’s milk cheese traditionally eaten for lunch in old times by Welsh coal miners. Originating in Wales, it is now made primarily in Somerset, England. This cheese has rich, earthy, savory, and creamy flavors and a moist and slightly crumbling texture. With this cheese, make sure you taste the rind. You’ll note that the cheese appears to have a layered, varicolored appearance. In this semi-aged cheese, these distinctions in appearance and flavor come from proteolysis – the process by which proteins, under the rind, are broken down by enzymes. This happens from the outside in, giving the rind its musty, earthy flavor, and the cream just beneath rind an oozy, mushroomy quality. The ideal pairing for our full-bodied, creamy-textured Pinot Gris, this unpasteurized cow’s milk cheese from Switzerland is not to be confused with “swiss cheese” (the bland one with the holes). This alpine cheese is famous for its smooth, creamy texture and robust flavor, achievable only in the alps, where it is made when the alpine cows are grazing on flowers in high, summer pastures. Today, L’Etivaz is still made in the old style, stirred in copper cauldrons over wood fires on the mountainside! In the 1930s, when the Swiss government pushed through new regulations on the production of Gruyère, several cheesemaking families broke away to preserve their traditions. 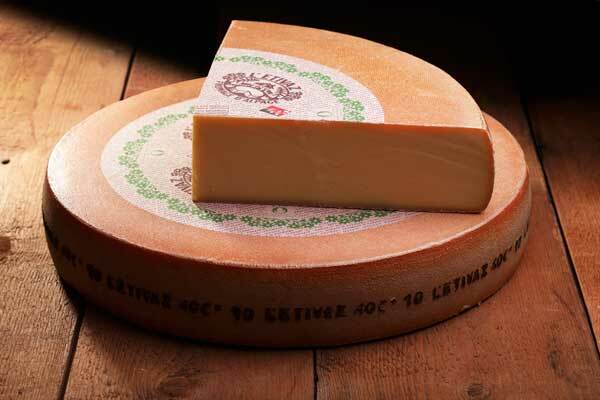 Thus, we see the birth of L’Etivaz, a cheese named for the Swiss village where the co-op originated. In 1999, L’Etivaz was given the distinction of being an Appellation d’Origine Protégé, a status previously only granted to wine regions. See our Wine and Cheese Pairing Part I here. Stay tuned for more cheese pairings! If you haven’t met them, Sophie and Paul Boban-Doering are the owners of Fromagerie Sophie, a cheese shop in downtown San Luis Obispo that has quickly proven itself to be one of SLO’s most treasured and unique gems. When Sophie and Paul opened Fromagerie Sophie, the cheese game in SLO was immediately elevated, and no one is more appreciative of that then those in the local wine industry. Here at Claiborne & Churchill, we finally have the opportunity to offer our guests a fantastic new tasting experience: a flight of five wine-paired cheeses from Fromagerie Sophie! Each pairing was painstakingly and lovingly selected, and the cheese plates are offered daily in our tasting room. Recently, our tasting staff had the pleasure of receiving an educational cheese tasting with Paul, and we couldn’t be more excited to talk about these cheeses with you and share some of the stories that he passed along to us! Each day this week, we’ll be telling stories about a different cheese from our cheese flight. Read below for a description of each Fromagerie Sophie and Claiborne & Churchill pairing, and if you like the sound of these, come in to our tasting room today to try them! 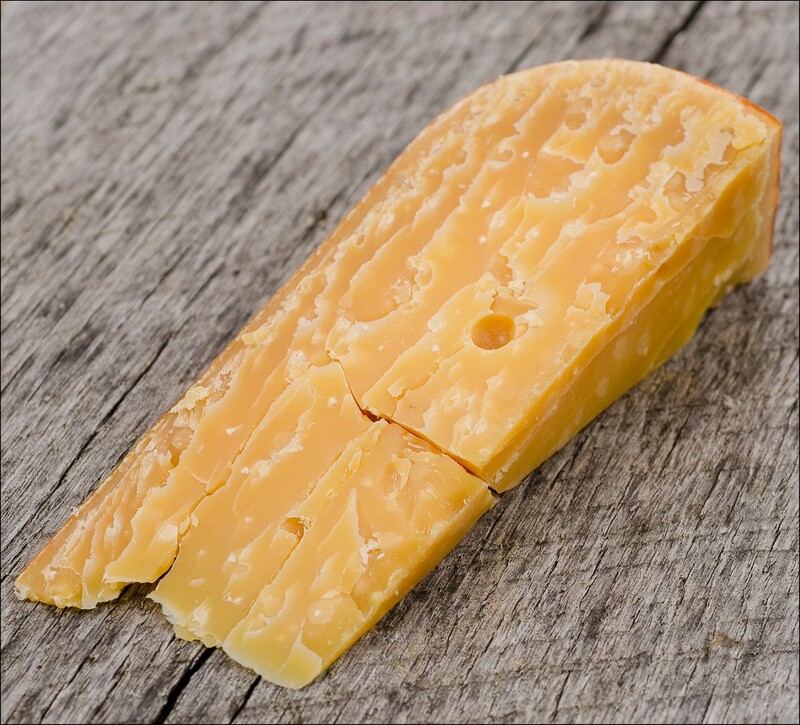 Our well loved Gewürztraminer, with its bright, spicy aromas and notes of lychee, is the perfect pairing for this caramely, aged gouda from Beemster, Holland. L’Muse Signature Gouda is aged for two years, and is deep amber in color with well-distributed protein crystals. Creamy with slightly salty, nutty notes, this cheese has a deep, complex, and long finish that sets off the bright acidity, spice, and tropical fruit of our Gewürztraminer! You’ll notice this cheese has some tiny, crunchy crystals in it, giving it a remarkable texture. The crystals found in exquisite aged goudas, cheddars, and grana padanos are not “salt crystals” as some suspect. Rather, they come from tyrosine, an amino acid found in cow’s milk protein. When, during the aging process, the amino acid chains break down, tyrosine is released into the cheese, forming those amazing little crunchies! Stay tuned for more cheese pairings! Here at Claiborne & Churchill, we want to wish you all a very happy, healthy start to your 2016! In the spirit of celebrating “the new”, we have several announcements about exciting things happening at our winery in San Luis Obispo. Now that our garden and tasting room are all ready for 2016, we’d love to host your next private event. Contact Angela at angela@claibornechurchill.com for details and pricing. If you’re reading this blog, you may have noticed that we recently overhauled claibornechurchill.com with the goal of making our website more usable, visually pleasant, and informative for you. Feel free to explore our site, and if you’re new to our blog, check out some of our recent posts to learn about the 2015 harvest, recent events, and more. One of the more exciting pieces of news we have is that next door, we’ve been hard at work remodeling a two-bedroom duplex cottage on our property. Soon, it will be available for vacation rental! If you are from out of town, staying with us will be a marvelous way to enjoy the heart of wine country here in San Luis Obispo. Centrally located, we’re only a five minute drive to Pismo Beach and a fifteen-minute drive to Cal Poly. Stay tuned for photos of the space and pricing information. Note: Club members will have access to a special, discounted price on accommodations! This holiday season, we released brand new vintages of two of our most anticipated wines: 2013 Runestone Pinot Noir and 2014 Pinot Blanc. 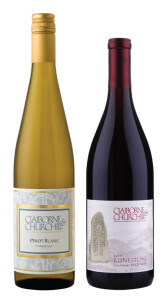 Be sure to come by our tasting room for a pour of each of these exciting vintages. To all our readers, Happy New Year, and we hope to see you soon!